Derived algebraic geometry is a far-reaching generalization of algebraic geometry. It has found numerous applications in other parts of mathematics, most prominently in representation theory. 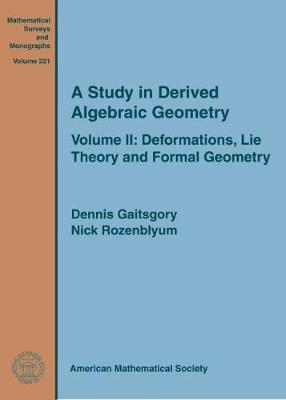 This volume develops deformation theory, Lie theory and the theory of algebroids in the context of derived algebraic geometry. To that end, it introduces the notion of inf-scheme, which is an infinitesimal deformation of a scheme and studies ind-coherent sheaves on such. As an application of the general theory, the six-functor formalism for D-modules in derived geometry is obtained. This volume consists of two parts. The first part introduces the notion of ind-scheme and extends the theory of ind-coherent sheaves to inf-schemes, obtaining the theory of D-modules as an application. The second part establishes the equivalence between formal Lie group(oids) and Lie algebr(oids) in the category of ind-coherent sheaves. This equivalence gives a vast generalization of the equivalence between Lie algebras and formal moduli problems. This theory is applied to study natural filtrations in formal derived geometry generalizing the Hodge filtration.